Some months ago, my daughter-in-law (Juicy Health) mentioned using Bone Broth in her recipes, and enjoying a steaming mug of the broth to drink. Little bells started to go off in my head as memories came flooding back of my paternal grandma’s kitchen and a huge cauldron-like pan simmering on the stove whenever I visited; I can still remember the lovely aroma, the black cauldron which was so heavy (just like a witch’s cauldron!) also the delivery of her weekly meat order which always included a bag of bones from which she made her own bone broth for use in soups and stews. Such a good description of bone broth comes from WellnessMama.com that I have copied some of it below. I use exactly the same ingredients to make my own broth, and I also use the same method although I have to admit I don’t simmer it for as long as 48 hours; usually overnight or for at least 12 hours during the day. Broth (or technically, stock) is a mineral rich infusion made by boiling bones of healthy animals with vegetables, herbs and spices. You’ll find a large stock pot of broth/stock simmering in the kitchen of almost every 5-star restaurant for its great culinary uses and unparalleled flavour, but it is also a powerful health tonic that you can easily add to your family’s diet. Broth is a traditional food that your grandmother likely made often (and if not, your great-grandmother definitely did). Many societies around the world still consume broth regularly as it is a cheap and highly nutrient dense food. Besides its amazing taste and culinary uses, broth is an excellent source of minerals and is known to boost the immune system and improve digestion. Its high calcium, magnesium, and phosphorus content make it great for bone and tooth health. 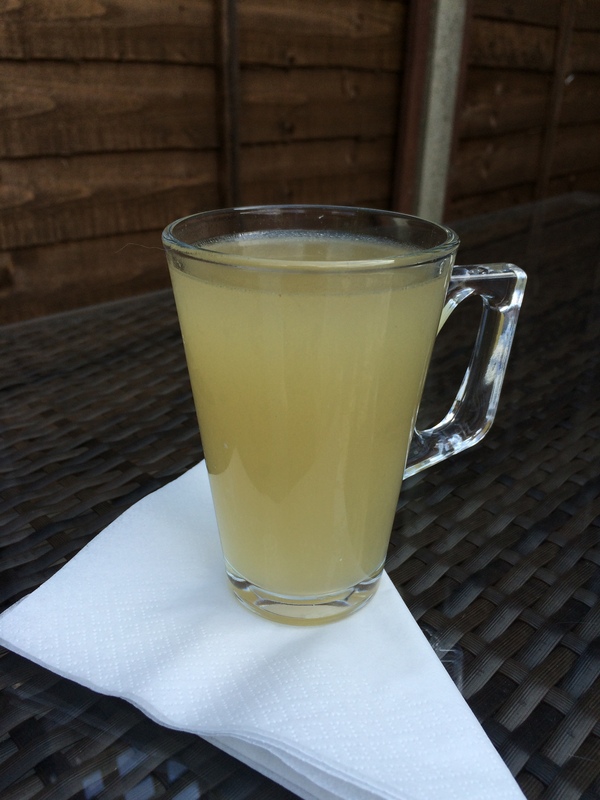 Bone broth also supports joints, hair, skin, and nails due to its high collagen content. In fact, some even suggest that it helps eliminate cellulite as it supports smooth connective tissue. Homemade, nutrient dense bone broth is incredibly easy and inexpensive to make. There is no comparison to the store-bought versions which often contain MSG or other chemicals and which lack gelatin and some of the other health-boosting properties of homemade broth. In selecting the bones for broth, look for high quality bones from grass-fed cattle or bison, pastured poultry, or wild caught fish. Since you’ll be extracting the minerals and drinking them in concentrated form, you want to make sure that the animal was as healthy as possible. • Optional: 1 bunch of parsley, 1 tablespoon or more of sea salt, 1 teaspoon peppercorns, additional herbs or spices to taste. I also add 2 cloves of garlic for the last 30 minutes of cooking. You’ll also need a large stock pot to cook the broth in and a strainer to remove the pieces when it is done. The first step in preparing to make broth is to gather high quality bones. As I said, you can find them from sources listed above or save them when you cook. Since we roast chicken at least once a week, I save the carcass for making broth/stock. I usually aim for 2 pounds of bones per gallon of water I’m using to make broth. This usually works out to 2-3 full chicken carcasses. If possible I’ll also add 2 chicken feet per gallon of water (completely optional!). • I also add, per batch, a bunch of parsley from the garden. Since I make in bulk, I usually use about 4 times the amount of each of these. You can make in any amount, just multiply or divide the recipe up or down. • If you are using raw bones, especially beef bones, it improves flavor to roast them in the oven first. I place them in a roasting pan and roast for 30 minutes at 350. • Then, place the bones in a large stock pot (I use a 5 gallon pot). Pour (filtered) water over the bones and add the vinegar. Let sit for 20-30 minutes in the cool water. The acid helps make the nutrients in the bones more available. • Rough chop and add the vegetables (except the parsley and garlic, if using) to the pot. Add any salt, pepper, spices, or herbs, if using. During the first few hours of simmering, you’ll need to remove the impurities that float to the surface. A frothy/foamy layer will form and it can be easily scooped off with a big spoon. Throw this part away. I typically check it every 20 minutes for the first 2 hours to remove this. Grass-fed and healthy animals will produce much less of this than conventional animals. During the last 30 minutes, add the garlic and parsley, if using. Remove from heat and let cool slightly. Strain using a fine metal strainer to remove all the bits of bone and vegetable. When cool enough, store in a gallon size glass jar in the fridge for up to 5 days, or freeze for later use. I use soup bags to freeze my broth and keep a couple of drawers in my freezer just for these. My husband loves a mug of steaming broth with his lunch and I use it as a base in soups, and to cook quinoa and rice. I never let a cooked chicken carcase get thrown out and if I haven’t time to turn it into broth straightaway, it gets popped into the freezer for another day. I source beef bones, ham bones etc from my local butcher as well as raw chicken carcasses and you will often find a huge pan simmering away on my hob. Another little tip I learned was that when I peel vegetables to keep all the peelings in a polythene bag and pop them in the freezer. As soon as I have a good few bagfuls I use these to make vegetable stock in the same way. Everything goes in from onion skins to carrot tops; potato skins to cabbage leaves. As they say, the more the merrier ! This entry was posted in Lunch and tagged Bone Broth, Bones, Cooking, Gluten Free, Healthy Eating, Lunch, Recipes. Bookmark the permalink.